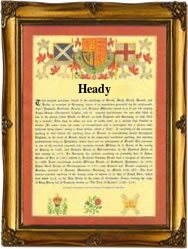 This interesting surname with variant spellings Hidey, Heddy, Heady, etc., is a topographical name for a dweller by the promontory or hill surrounded by streams, deriving from the Old English pre 7th Century "heafod" meaning "head" plus "eg" "a piece of land situated between streams". The surname dates back to the mid 12th Century, (see below). Further recordings include one Thomas del Heved (1275) "the Hundred Rolls of Nottinghamshire", and Byheved (1285) "the Assize Court Rolls of Cheshire", and Walter Othehede (1331) "Descriptive Catalogue of Derbyshire Charters". Church recordings of All Hallows, London Wall include John, son of George and Elizabeth Heady who was christened on September 2nd 1627, Mary, daughter of George and Elizabeth Heady was christened on August 19th 1629, and Sarah their daughter was christened on March 2nd 1634. One Daniel Heady (aged 24 yrs), together with his wife Catherine (aged 24 yrs) and their son Denis, were famine emigrants who sailed from Liverpool aboard the Yucatan bound for New York on July 22nd 1846. The first recorded spelling of the family name is shown to be that of Ralph Heued, which was dated 1166, in the Pipe Rolls of Norfolk, during the reign of King Henry 11, known as "The Builder of Churches", 1154 - 1189. Surnames became necessary when governments introduced personal taxation. In England this was known as Poll Tax. Throughout the centuries, surnames in every country have continued to "develop" often leading to astonishing variants of the original spelling.